Katikiiro Charles Peter Mayiga has vehemently denies rumours circulating on social media that he is set to replace Edward Ssekandi as the next Vice President of Uganda in the impending cabinet reshuffle. Those behind the rumours claim Mayiga and President Museveni have held secret talks over former’s appointment as the country’s next Vice President. And that it’s for purposes of seeking Kabaka Ronald Mutebi sanctioning, that President Museveni last week visited the King at his Banda palace. In a post on his social media platform on Monday evening, Mayiga says that he is not the next Vice President, and that the president’s visit to the Kabaka wasn’t at all to do with the rumour. Mayiga explained that there is no need for under-the-table deals whatsoever. The Buganda kingdom premier recently criticised those comparing the President Museveni and the NRM government e to previous regimes led by former presidents Apollo Milton Obote and Gen Idi Amin Dada. In his address to the Buganda Lukiiko sitting at Bulange-Mengo recently, Katikkiro Mayiga said that the comparison is farfetched and hollow. “The truth is the NRM government is way better than Amin’s and Obote’s government in so many aspects. It’s only those who don’t know the past or have not read history who can compare the NRM government with those governments.” He said. 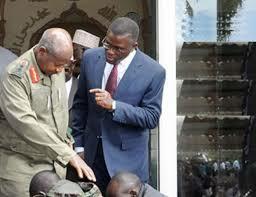 “But also, we should not compare any government with the bogus governments of Amin and Obote. If we’re to compare governments, then it should be with progressive governments such as Singapore, Malaysia or even Ghana. We were at the same level of development with those governments and now see where they are.” he said.